Crazed In the Kitchen: Blogger Idol: I'm Out! No, I'm Back In! VOTE FOR ME!! Blogger Idol: I'm Out! No, I'm Back In! VOTE FOR ME!! 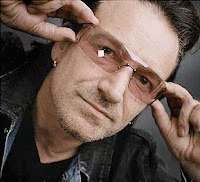 Click on Bono to vote for me--that's fun, right? Well, that may be exaggerating a bit. But my last week in Blogger Idol has been a bit of a roller coaster ride, and now I NEED YOUR HELP! Our last assignment was to work with another contestant and interview each other. I was lucky enough to be paired with Jenn from "Random Thoughts n' Lotsa Coffee." We had a good time getting to know each other and working on the post together. We burned up facebook and gmail chats, and came up with a great post that you can read here. But, alas, it wasn't enough. Fate and the Blogger Idol judges are fickle, and last Friday I learned that we had been eliminated. But the Powers That Be of Blogger Idol had a trick up their sleeves, and on Saturday I learned that I had been...SAVED! 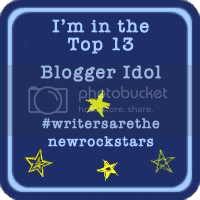 THAT'S RIGHT--I'M BACK IN BLOGGER IDOL!!! Oh, wait. Except now I have to bring it. And by bring it, I mean BRING IT. Because now I have to prove that they didn't make a mistake in bringing me back. My superfamily's super alter egos are called "The Vaginator," "WhereDaddy," "The Inquisitor," and "Ole Blue Eyes." That's right--votes make a huge difference every week! And like I said, I need to bring it this week--with my post and with the votes. So please, let's show those Blogger Idol head honchos that they made the right decision in bringing me back. VOTE FOR CRAZED IN THE KITCHEN!! Clicking here to vote for me is by far the most fun, don't you think? Voted and shared. Good luck!! Thank you everyone, for your votes!! 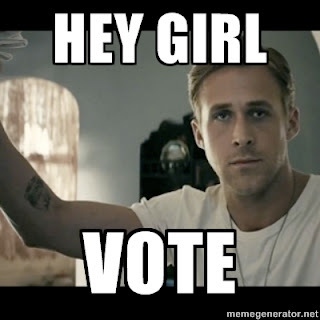 Ooh, thanks for the Ryan Gossling motivation!